Week 1 was...not good. There were 30 less touchdowns scored in Week 1 of 2017 than Week 1 of 2016, and it was discovered that David Johnson will miss multiple months of the season and Odell Beckham Jr. could miss the early weeks of the season. Oh, and key assets of fantasy teams, Mike Evans and Jay Ajayi, didn't even play. Weird week. There were some positives, though. Guys I preached positivity about like Stefon Diggs, Zach Ertz, and Matthew Stanford seem to be in great positions. Let's take a look at week 2 and hope it's more normal. Love 'Em: Philip Rivers @ MIA: Phillip Rivers was my sit of the week last week, and I'll admit, he proved me wrong. He hung 3 TD's on the unquestioned best secondary in the league. Now, he faces a Miami defense that really hasn't played since Week 3 of the preseason. They gave up the 4th most fantasy points to quarterbacks last year, and they play at Los Angeles where Rivers put up a higher QB rating than on the road. Leave 'Em: Carson Wentz @ KC: Carson Wentz looked pretty good last week against Washington, throwing for 300+ yards and 2 touchdowns. This week, he faces a significantly better defense in Kansas City that is even better at home. They completely shut down Tom Brady in the opening game of the season, and have only given up 300+ yards 4 times in the Andy Reid era. I like Wentz this year and don't think last game was an anomaly, but I'm waiting for him to produce again before I throw him in my lineup. Love 'Em: Ty Montgomery @ ATL: Even though nobody thought Ty Montgomery was not capable of handling a full workload, he was on the field for 90% of snaps last Sunday, which is insane. He did well against an elite Seahawks defense, totaling 93 yards from scrimmage and a score. Now, he faces a much less intimidating Falcons defense that gave up the most catches to running backs last year and gave up 11 to the Chicago backs last week. 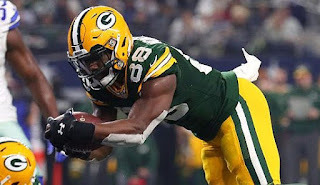 In what figures to be a shootout game, Ty Montgomery undoubtedly is an RB1. Leave 'Em: Frank Gore Vs. ARI: With Andrew Luck out it's hard to start any Colts players. It's especially hard when said player is facing a defense that gave up the third least fantasy points to RBs last year, and gave up only 2 YPC last week to Ameer Abdullah. Oh, and did I mention there's a new rookie (Marlon Mack) that looked much better than this player last week? It's not a good idea to start Gore tomorrow. Love 'Em: Tyreek Hill Vs. PHI: Tyreek Hill got off to a great start last week. He went 7/133/1 against a tough New England Patriots defense. Now, he faces a weak Philadelphia defense who lost their best cornerback Ronald Darby. All of the other important pieces on the secondary own sub-65 Pro Football Focus grades and Hill will take advantage of the lack of speed in their secondary with a big week. Leave 'Em: Kenny Golladay @ NYG: Yes, I'm aware of what Kenny Golladay did last week. But, he was only on the field for 62% of snaps and half of his receptions went for touchdowns, which won't continue. The Giants, who happen to have a very good secondary, will most likely key in on him as Detroit's WR2. I'm definitely leaving him on my bench until he proves himself for a second week. Love 'Em: Charles Clay @ CAR: In a weak Bills offense, Charles Clay appears to the #1 red zone target. He caught 4/53/1 last week and gets a matchup with a Panthers defense that gave up the second most touchdowns in the league last year. They gave up 12 touchdowns to TE's last year so Clay's got a good chance of scoring one this coming week. Leave 'Em: Jordan Reed @ LAR: Clearly Jordan Reed is dealing with yet another injury. He finished with only 36 yards on 5 catches last week, which is uncharacteristic of him. Now, he faces a Rams defense that allowed the 5th least fantasy points to TE's last year and shut down Jack Doyle last week. If I have another option, I'm staying away from Jordan Reed this week.